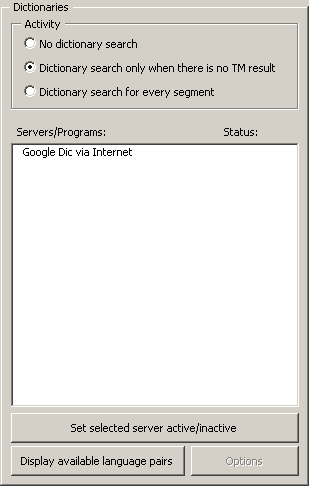 When this checkbox is checked, no dictionary search is executed. When this checkbox is checked, the dictionaries defined in the Document options will be searched only if the TM search was not successful for an empty TU being opened. When this checkbox is checked, the dictionaries defined in the Document options will be search for each empty TU when it is opened. The results of a dictionary search are only displayed in the Scout. In the Servers/programs list, the available machine translation engines are activated and customized. Only the engines available for the given language combination are displayed. This means that if no dictionary is available for the given language pair, no dictionary search engine is displayed. Note: If a dictionary search engine is missing from the list, please send a note to the MetaTexis support address: support@metatexis.com. If technically possible, the missing engine will be added. Before a dictionary is actually used, you must activate it. To activate an engine, double click on the item in the list, or select it and click the Set selected server active/inactive button. Using the same command, you can set an engine as inactive. When you click the Display available language pairs button, the available language pairs for the selected machine translation engine are displayed. If special settings can or have to be made for a translation engine, they are displayed in the Options frame. In the following sub-sections, the available options are explained.